Make your deposits with Adda52.com and get rewarded all this month. Get up to Rs.30,000 as bonuses on your deposits from September 4th to October 2nd 2014. Plus test your luck in rummy tournaments like Depositors Free Rolls which are scheduled at 9 PM on dates 4th, 11th, 18th and 25th of September along with Depositors Bonanza which is scheduled to begin on 2nd October 9PM. 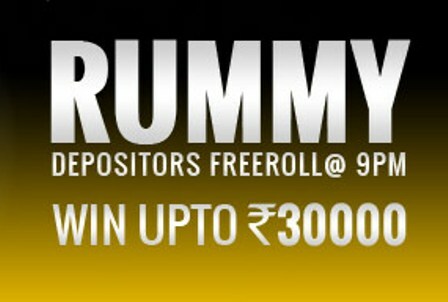 Buy a minimum of Rs.100 Real Cash chips (use Bonus code: 21DEPRUMMY or 13DEPRUMMY) and get 2 complimentary tickets for Rummy Depositors Free roll 5k event. In addition to this, 30% sign up bonus will be awarded for the first time depositors. Buy real cash chips worth Rs.200 or less and get 2 complimentary tickets for Depositors Free roll. On purchase of more than Rs.200, 3 complimentary tickets for Depositors Free roll will be granted. Also on making deposit of Rs.500 or more 1 complimentary ticket for Depositors Bonanza will be awarded. Use Bonus Code: 21DEPTKT to avail this offer. We hope you have a great time playing and earning at Adda52. Feel free to visit our other bonus and free roll related news in the News and Promotions category. Also, we invite you to send us your valuable comments and suggestions to improve the quality of articles, website performance and more. You can add your feedback in the comment section below.